« If I Were a Dust Particle . . . More from Indian Hill Elementary! Who wouldn’t love books at this school in Lexington, SC? Librarian D’Etta Broam is a book dynamo. Yes, she really did meet me in this vulture hat to honor Vulture View. Of course, there was that on camera interview I did with their local vulture puppet, “Bill,” who rather likes the word REEK! At Pleasant Hill Elementary, D’Etta is doing some terrific special days of reading. Small groups of readers order a paperback book. Then they all bring the book and lunch and read and do special activities related to the book. Because I was visiting, she featured One Is a Snail and Trout, Trout, Trout: a Fish Chant books. But she does this project even when there is not an author visiting. 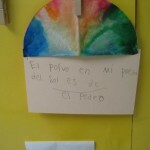 Also, take a look at what the Spanish Immersion classes are doing at her school. They do science and math in Spanish. 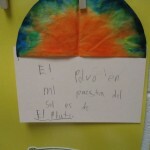 Senorita Hood had them write sentences about where the dust in their sunset had originated. 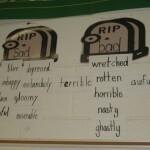 I love how one classroom retired (buried) general, overused words in favor of specific terms. The kids actually called the teacher on it if she used one of those words! They scoured The Bumblebee Queen for such words but found none. Whew. I believe they said they had learned this technique from Ralph Fletcher. 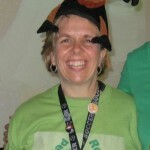 D’Etta and others organized a huge reading festival for the entire community. More on that later. Hurray, D’Etta, for all you do! 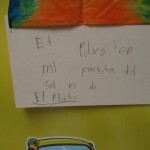 Pleasant Hill Classroom uses Ralph Fletcher’s technique of “retiring” certain words and finding alternatives. Stars Beneath Your Bed reaction in Spanish! More thoughts on “polvo,” i.e. dust.